Over the weekend we drove to South Haven, MI to go to out annual chestnut picking place. The taste is far better than the grocery store nuts, and no WORMS! It's about the only thing at the store people can sell for 3.99 a pound with worms. I mean, WTF?! YUCK! 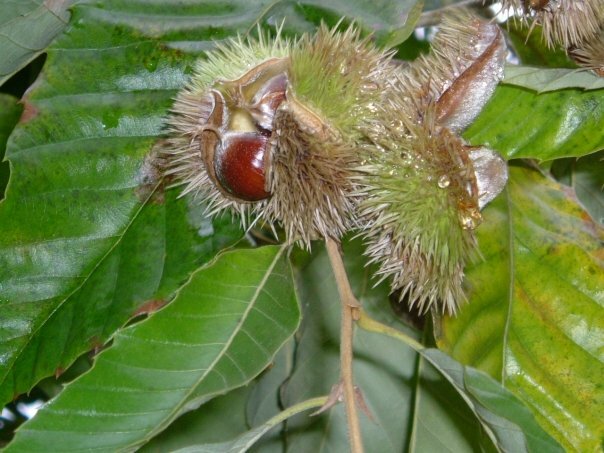 There's a couple of things I've learned over the past few years with chestnut picking. 1- those burrs hurt! You need gloves-good gloves. Maybe the kevlar ones at the hardware store that cost $17/pair. A good pair of leather gloves will last you a lifetime. That and a pair of good shoes / boots- NO SANDALS. Kids should wear their winter snow boots to go chestnut picking. The burrs look like sea urchins, so what can you do... occasionally you do get pricked if you hold too tight. The best way is to stomp a burr with your foot, and then pick out the nuts with your gloved hand... OR pick up the nuts that are already out on the ground. Those are excellent, and have nothing wrong with them-They just dropped out of the open burrs. 4- Chestnuts have to age a little. I didn't know this, and ate many bland/hard to peel chestnuts the first year. Just like any other nut (Walnut/peanut/hazelnut), they hare hard to eat when they're fresh. They need to lay out a little and lose moisture. Walnuts taste much better after they've dried out... this is true for all nuts! So just the same, the chestnuts need to be laid out in an open container or counter to lose moisture. Maybe a 2-3 days until the shells give when you press on them. That is when they are OK to eat. They are sweeter and 5000% easier to peel. That beign said, my thumbs are sore and chapped. This happens every chestnut season. I'm such a chestnut addict, that I have been eatng them raw. Might roast some later this week after they've dried out some.